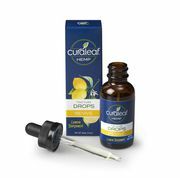 The Curaleaf Lemon-Flavored Tincture provides long-lasting relief in a versatile and easy-to-use form. This high quality, lab-tested tincture can be consumed under the tongue, added to beverages or food, or applied topically along with other all natural oils and lotions. This zesty lemon-flavored oil-based tincture offers a more pleasing administration experience for a high concentration solution containing 30mg active cannabinoids. Each bottle contains 30mL of cannabis oil and MCT oil with natural flavoring and terpenes. Onset typically takes effect within 15-40 minutes and provides relief for 2-3 hours. The Curaleaf Lemon-flavored Tincture is available in ratios of THC: CBD 20:1, 1:1, and 1:20. Every bottle includes a dosing pipet dropper, measuring 0.25-1mL, for easy titration. A form of medication that is designed to take under the tongue but may also be added to liquids such as tea or coffee. Patients can see effects of the medication in as quickly as 15 minutes.